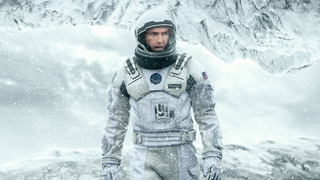 Excited for Interstellar? A lot of people are - except a growing contingent of Theatre owners angry about Christopher Nolan's decision to have the awesome-looking sci-fi movie début early in Cinemas that can show it through analog projectors. As revealed at the end of last week's trailer, Cinemas capable of showing the movie in 70mm, 70mm IMAX or 35mm film formats will get access to the movie two days ahead of the November 7th release date. Nolan himself has been a long proponent of shooting on film over digital formats: a growing rarity in modern cinema as Film projectors are phased out for digital alternatives, and movie studios are slowly but surely phasing out sending film reels to Cinemas (ironically, Interstellar's distributors Paramount were the first Studio to completely stop distributing film reels as of earlier this year). Most American cinemas have undergone the expensive process of being refitted with digital projectors by now - hence why certain Cinema owners are getting concerned over preferential treatment being given to Film-capable franchises. As covered by The Hollywood Reporter, some Cinema owners are criticising the move as an unnecessary 'step back' in technological advancements - especially as the transition to digital formats was an increasingly expensive endeavour. But Nolan and Paramount themselves see the move as preserving the traditions of the moviegoing experience in the face of the digital expansion of the industry - and the debate is happening at an especially interesting time, as multiple Cinema chains across the world (including the US's largest, Regal) recently announced a boycott on next year's Crouching Tiger, Hidden Dragon sequel due to it premièring on Netflix on the same day it releases in Theatres as a defence of the moviegoing experience as well. No matter where you stand on the digital or analog format debate though, it's interesting to see a film about ensuring Humanity's future is also making an eloquent, real-life case for preserving the traditions of the past.